Beef & Poultry, Chicken & Kidney, Lamb & Chicken, Turkey & Liver Our FELIX® As Good As It Looks Doubly Delicious Adult Cat Meat Selection in Jelly cat food is made with two different types of tender meat or fish, served in a mouth-watering jelly. We're sure you adult cat will love the variety of flavours available, especially as they're stored in individual pouches to retain their enticing aromas and tempting textures. 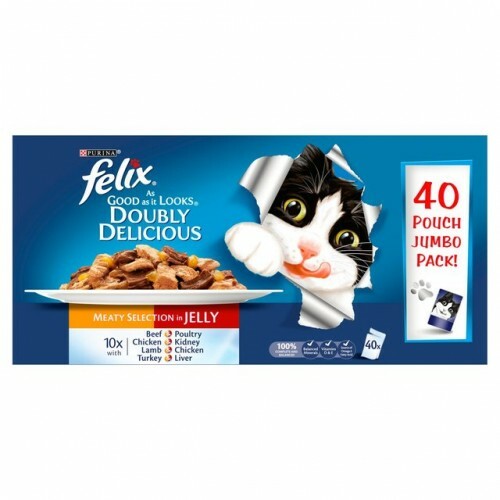 Providing your cat with all they need to live a happy life as an adult cat, our FELIX® As Good As It Looks Doubly Delicious Adult Cat Meat Selection in Jelly is packed with essential vitamins and minerals to keep your cat supported. 100% of your cat's daily needs - vitamins D & E, balanced minerals and source of omega 6. Irresistible meals for mischief makers. ...Is a range of delicious meals made with two different types of tender meat or fish in a delicious jelly which look and smell so meaty, it looks like food you might have cooked yourself. Now your cat can enjoy two of his favourite varieties in one delicious meal! It's an irresistible meal for your cat. 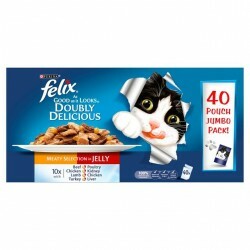 Also, Felix As Good as It Looks Doubly Delicious is available in a wide range of fishy and meaty flavours to satisfy your cat's love of variety. That's not all! These delicious meals are A source of essential Omega 6 fatty acids. The right combination of balanced minerals. Contains Vitamins D & E. They are full of healthy goodness to satisfy 100% of your cat's daily needs when fed according to the feeding guidelines on the pack.